Clean lines, built-ins and simple door styles dominate kitchen designs. Contemporary- styled kitchens will overtake traditional to be the second most popular design after transitional. White and gray painted cabinets dominate kitchen color schemes and show no signs of slowing down, especially gray. Two-toned kitchens are gaining in popularity. Also mixing it up: materials and metals, across surfaces and as accents. While wood cabinets dominate kitchen designs, metal – currently a small segment of the cabinet market – appears to be emerging. Furniture-look pieces, roll-outs, pullouts and under cabinet lighting (LED) are among the most popular kitchen cabinet features. Quartz is the most popular kitchen counter-top material, and trending up. Granite, the second most popular counter-top material, is trending down. Induction cook-tops and convection ovens are trending higher, and microwave drawers are outpacing freestanding or built-in microwaves. Technology in the kitchen is increasing. About one-third of NKBA professionals included wiring and pathways for future tech integration. Also trending: internet connected appliances and docking stations. Interior barn and pocket doors are trending up. Accessible and/or universal design features continue to trend up for kitchens. Come into to our showroom and talk to one of our skilled designers about current trends and how we can incorporate them into your lifestyle! 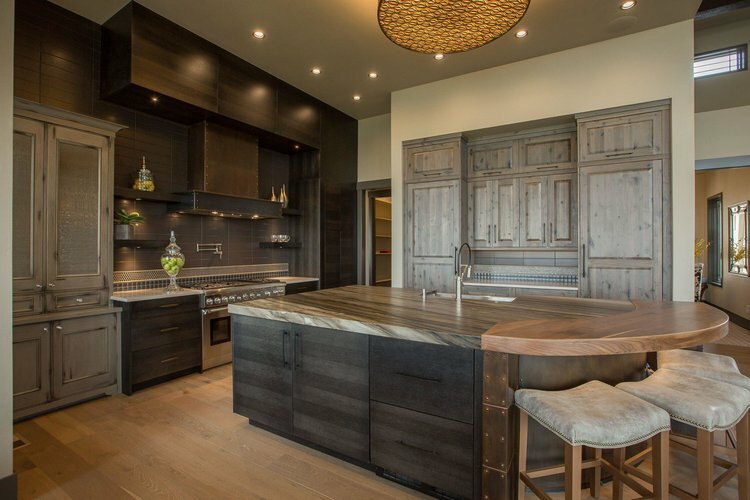 This kitchen provides a multitude of finishes and textures, from old world to reclaimed wood.